The Security and Leakage Belt is made of a soft 32mm (1.25") elastic belt attached to a retaining ring that fits between the bag and the adhesive sections of the pouch. *Belts are individually made and allow for the differences in waist measurement and the type of pouch being used. *A fitting is not required when ordering a Leakage belt. All the relevant information is requested on the Order Form. *Pouch: To ensure correct manufacture of the belts retaining ring it is requested that a customer's pouch be enclosed with the order. The hole cut into the belt flange is specifically made for your pouch through which the bag section is pulled through. *Waist Size: The 32mm (1.25 inch) wide elastic belt has an adjustment of approx. 30cm (12 inches) and only an approx waist size is required. 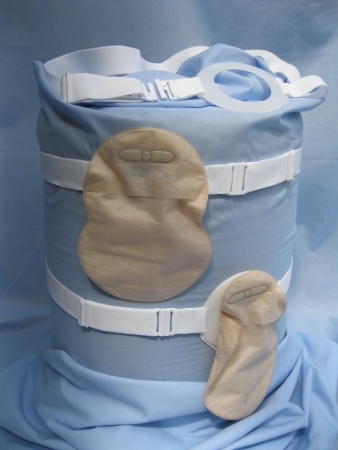 *Fitting the Belt: The Pouch should first be fitted over the stoma in the usual way, then pull the bag section of the pouch through the hole in the plastic retaining flange and adjust to fit comfortably between the bag and the adhesive section of the pouch/appliance. Clip the fastner together and adjust the length with the slide. For UK Citizens: The belts are available from the NHS with a Doctors Prescription. If you wish to purchase one of our belts then please go to the Order Form page for details.